This uses video goggles with a head-tracking sensor to remotely control the orientation of a camera mounted on a pilot-less plane, letting you virtually explore the heavens. Apart from the general wow-factor of flying around the sky without ever leaving the ground, it reminded me of another piece of impressive technology I came across recently: quad-copters. Here, a high-speed DSP is used to combine realtime feedback from gyros and sensors on position, wind direction, etc. to control four rotating blades independently allowing for stationary hovering in a wide range of conditions with no pilot input required. Great for remote video surveillance etc. Combining these two pieces of technology seems like a perfect opportunity. Has anyone done it yet? And a missing piece of the puzzle: even using stereo cameras to feed the video goggles, the image will still be flat since there is no way to remotely focus it (other than relying on auto-focus). Has anyone developed a set of video goggles that can track the eye’s ability to focus on specific objects? Combine that with a pair of remote cameras that can track the eye’s focus in that way and you could have REAL telepresence (once the latency isn’t too high, of course). Isn’t it great that we live in an age where such amazing technology is affordable enough to let people devise interesting hacks in their spare time…? Thanks to Kieran for pointing me towards this impressive Wii Remote hack, covered by Engadget here. Johnny Chung Lee has done a marvellously simple hack which uses the standard Wii remote controller, plus some ballpoint pens modified to emit infra red, to convert any surface into an interactive touch-screen. With multiple pens, you can support multi-touch effects (as seen on the iPhone and iPod Touch), and previously mentioned on this blog back in March 2006. Johnny’s software to make all this work is free, and available here. When I had a film camera 15 years ago, I took almost no photographs with it: about one roll of film per year, on average. Then I got a digital camera, and since then I’ve taken a ridiculous number of photos – currently around 36,000 and climbing. So, while I wouldn’t call myself a big photography buff, I do have a passing interest in photography techniques and methods. We’re used to looking at photos where everything is in focus (to infinity) so when the depth of field is restricted, the brain is tricked into it’s a model scene. The effect is quite surreal! There were lots of impressive products at CES 2007, most of which have been covered in detail elsewhere. Buried deep within LG’s massive stand was a 42″ high-definition LCD screen displaying genuine 3D video. This has apparently been around for a few months, but it was the first I’d heard of it. The effect is stunning – proper 3D with no special glasses required. As with traditional 3D displays (such as IMAX and motion simulator rides), it takes your eyes a second or two to adjust – then everything jumps into focus. Of course, there are some limitations. The optimal viewing range is 3M-7M from the display, with a maximum viewing angle of around 30 degrees. All the video on display was computer generated; I’d have liked to see some live video as well. The screen works by integrating 25 separate LCD panels, each of which produces a display with a very narrow viewing angle. The 25 views are positioned around the objects being viewed, so that standing in any position, your eyes will see only two views at a time (one for each eye). The panel is thicker than a normal flat panel, but not overly so – about 6-8″ deep. Capturing live video to work with this system will require some advanced cameras, since it would need to record 25 images simultaneously, each at a slightly different perspective. Regardless, this is deeply impressive technology – some day, no doubt, all TVs will look like this. If 3D television wasn’t enough, we stumbled upon 3D sound in the form of Smyth Research’s new virtual surround sound headphones. These aim to allow headphone users to experience a surround sound movie or album in all its glory, without alienating their neighbours. While most DVD players and A/V receivers offer some form of downmixing to let you listen to surround sound movies on headphones, this new system is in a completely different class. A sensor mounted on the headphones identifies the position and orientation of the headphones in space, and the sound is adjusted accordingly. When you turn your head to the left or right, audio coming from each speaker appears to stay at the same location within the room, rather than moving with your head as normally happens with headphones. The effect is amazing – the first time I heard it, I immediately took the headphones off to confirm that the soundtrack hadn’t simply been routed back to the main speakers again. The system we saw used an infra-red transmitter positioned above the TV to send out a reference signal which a reciever on the headphones picked up, analysed, and then transmitted back to the sound processor via the audio cable. This approach allows several headphones to be used at once in a single room. With the infra-red solution, listeners must not turn their head more than 60 degrees away from the TV, or the effect is lost. This can be overcome using an alternate RF positioning system. Smyth Research don’t sell hardware products themselves; instead, they are licensing the technology to manufacturers for inclusion in their audio equipment. The demo we heard was using Yahama equipment; expect products to be on the market by the end of 2007. As an aside, Smyth Research are based in Bangor, Northen Ireland – it was nice to see some Irish representation at the show. 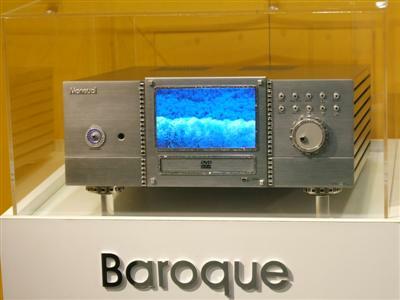 They were previously involved in the development of the DTS Surround Sound system, so their audio pedigree is well established. A4Tech had a stand in the international section over at the Hilton, where they were showing their laser mouse that works on glass. Most optical mice fail dismally when moving over a shiny or glass surface; not the A4Tech mouse. I spent some time playing with their demo setup, and can confirm that it worked just as well on glass as on other surfaces. A simple trick, no doubt, but extremely useful. Apparently the mouse is already on sale in Korea – hopefully it will make it to Europe soon. Alongside the main CES convention, there were numerous seminars and panel sessions to discuss issues of interest to the consumer electronics industry. Most of these cost money to attend, but some were open to all CES participants. How Digital Rights Management for movies & music can evolve into something less customer hostile. Several industry panelists (including a CNET reader flown in from the UK to represent the consumer) discussed these items at length; the audience then voted electronically on how they thought things would develop in the future. On mobile video, the verdict was: yes, there is a new and growing market for media playback on mobile devices, but access needs to become far less restrictive (both in price, and range of media available) before it will take off. Mobile video will supplement existing markets rather than replacing them. Dynamic content like news clips, music videos, and short length TV programs are more suited to these devices than feature length movies. One panelist predicted that the production style of programs will change to match the constraints of the mobile devices – more talking heads, fewer panoramic landscapes, etc. All reasonable points. However, the most important point was only briefly mentioned: mobile video need not be streamed. People use it to fill time when they would otherwise be bored (standing in a queue, waiting for something to complete), and it suffices to have pre-loaded content available on their mobile device; it’s not a big deal if it’s several days old. With modern video codecs and ever-increasing flash capacities, it’s quite feasible to store multiple movies or (more likely) TV programs on your portable device. I think this trend is just beginning to gather stream. 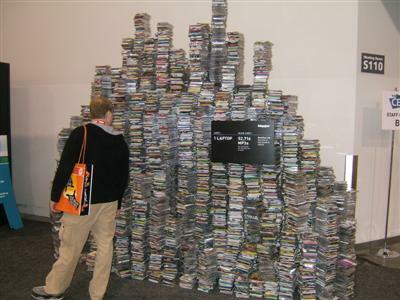 The panel were (eventually) united in their view that DVD wouldn’t be going away anytime soon – certainly not by 2010, as had been suggested. The tangible nature of a DVD, which makes it collectable, suitable for gifts, easy to use and distribute, etc. all combine to make it unlikely to disappear. I’m broadly in agreement with this view. It takes a long time for a given technology to die out; after all, there are still plenty of VHS tapes around, even though it is now difficult to buy a VHS recorder. I also doubt we’ll see broad acceptance of streamed video until most households have a fast broadband connection (where ‘fast’ means 10 MBps or higher, with no contention). Digital Rights Management (DRM) was the most contenious discussion, with representation from the legal profession, movie industries, and consumers, as well as several industry observers. Everyone agreed that some sort of rights management was essential, but making it transparent enough so that consumers were not unduly restricted when they tried to use media they believed they owned was judged difficult. Apple’s ITunes was given as an example of how to make DRM straightforward, so that customers are not always even aware that any special restrictions apply. The biggest hinderance to existing DRM technology is that it goes against the grain of what consumers are used to. If you buy a CD, you can take it to a friend’s house to share with them or loan to them. You can play the same CD in your living room, your bedroom, your car, on your laptop, and anywhere else that has a CD player. This is almost never true for media protected with DRM, especially where that media has been downloaded rather than delivered in some sort of physical packaging. While providers are entitled to protect their content, they need to find a less onerous way to do so than has currently been attempted. I have no doubt that this problem will be solved; until then though, consumers will continue to be highly suspicious of anything resembling DRM. How big is that hard disk? Seagate’s point, of course, is that you might want to think about backing up that hard disk … and naturally, they had a product designed to do exactly that. 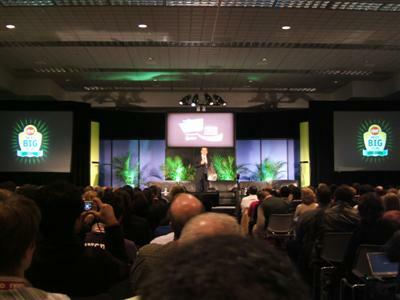 I’ve just returned from the Consumer Electronics Show, which ran from January 8-11 in Las Vegas. This was my first time attending the largest trade show in America (2700 exhibitors, 150,000 attendees) and it was quite an experience. Over the next few days, I’ll post entries about some of the more interesting products and companies I saw. I was travelling with some colleagues, and we had four days to cover the exhibition – just as well, since it covers ten large convention halls, and conference space in several nearby hotels. The scale of CES is hard to grasp – by lunchtime on the first day, we had cleared half of one hall and felt we were doing well – until we realised we had only cleared half of one corner of one hall! It was time for a more aggressive approach. By planning ahead, and stepping up the pace substantially, we managed to cover about 90% of the exhibits during the first three days! This left Thursday morning for some final follow-up visits to stands, and we were all done by lunchtime, leaving the afternoon for some R&R. The conference was well organised, with courtesy coaches between the different venues, free Internet access available in the halls (supplied by DivX), and even free international phone calls courtesy of Vonage, who had installed VoIP kiosks in the lobbies. Complimentary magazines from just about every consumer and electronics publisher you’ve ever heard of were also available outside the conference entrance, along with the six show guides and product directories. Two products were in evidence just about everywhere this year – large high-definition LCD televisions, and digital photo frames. Even manufacturers who didn’t sell photo frames were using them to display information sheets for their actual products. There was a wide and varied selection of Windows Media Centre PC cases from assorted vendors – perhaps the most impressive (if not the most practical) were the Diamond Media Centre range from Moneual, which featured a jewel-encrusted fascia panel and control knobs at prices ranging from $30,000 to $1,000,000, they are for elite purchasers only. While most of the larger vendors had extravagant stands with large floor areas, there were plenty of smaller stands there as well. The entry level cost for a stand is in the region of $6000-$8000 depending on location (about 2 metres x 3 metres) which is within reach for even small startups. There were surprisingly few freebies on offer. Other than the ubiquitous carrier bags, and a few trinkets like LCD pocket torches, watch batteries, and T-shirts, pickings were slim. The US magazine Consumer Reports (similar to Which? magazine in the UK) has been in the technology news recently. As part of a comprehensive test of antivirus software packages, they commissioned a consulting company to create 5,500 new viruses to see how well market leading programs would cope. It only takes a little scratching below the surface to show that their concerns are, at best, misguided. The viruses created for Consumer Reports were simple modifications of existing viruses, altered so that their signature was no longer identifiable. The viruses were kept in a secure environment, and all copies were removed after testing – only a single CD remains, which is kept in a locked and secure cabinet on site. Surprise, surprise – McAffee’s package didn’t do particularly well in the test; it relies heavily on a signature database to identify new threats. When viruses were still something of a novelty, this approach worked well – it often took weeks before a new virus gained notoriety, giving McAffee plenty of time to respond. By now however, it is so easy for would-be virus writers to develop new viruses, and variants on existing viruses, that a pure signature-based approach is no longer sufficient. A more pro-active approach is needed, that can identify virus-like behaviour and quarantine or block the affected program. Of course, there will be legitimate tools which end up looking like a virus – commercial tools can be recognised and permitted explicitly, while a mechanism can be included to allow users to grant access to other programs on an as-needed basis.